谢俐萍, 金幼虹, 叶芳, 罗玉, 杨娟霞, 陈霞. 离子型及Ⅰ型代谢型谷氨酸受体对大鼠温度过敏的调节作用[J]. 中国医科大学学报, 2018, 47(2): 145-150. XIE Liping, JIN Youhong, YE Fang, LUO Yu, YANG Juanxia, CHEN Xia. Regulatory Effects of Ionotropic and GroupⅠ Metabotropic Glutamate Receptors on Temperature Hypersensitivity in Rats[J]. Journal of China Medical University, 2018, 47(2): 145-150. 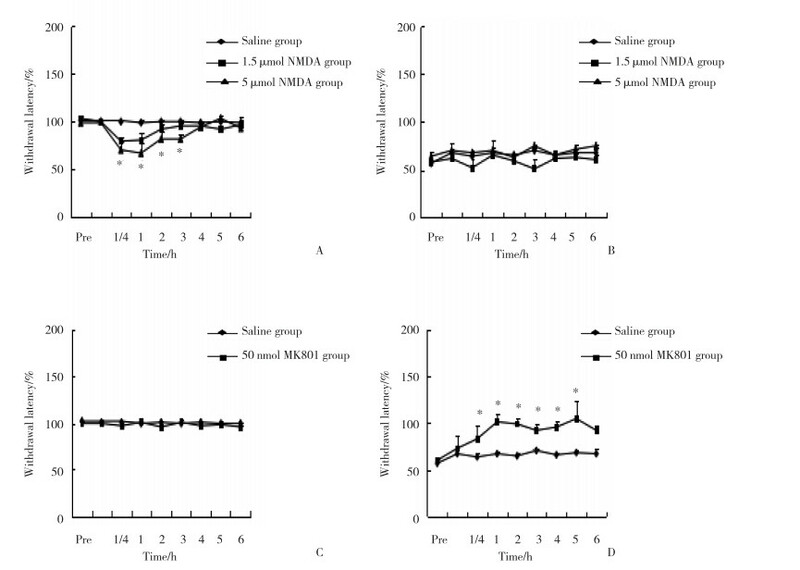 Abstract: Objective To study the effects of ionic and group Ⅰ metabotropic glutamate receptors on rats' thermal hypersensitivity by intraplantar administration of drugs.Methods After intraplantar administration of glutamate receptor agonists, L-glutamic acid (Glu), N-methyl-D-aspartic-acid (NMDA), and (RS) -α-amino-3-hydroxy-5-methyl-4-isoxazolepropionic acid hydrobromide (AMPA); a Group Ⅰ mGluR agonist, (S) 3, 5-dihydroxyphenylglycine[(S) -DHPG]; a noncompetitive NMDA receptor antagonist, (+) -MK801 maleate (MK-801);a competitive AMPA/kainate receptor antagonist, 6-cyano-7-nitroquinoxaline-2, 3-dione (CNQX); and a selective GroupⅠ mGluR antagonist, 7-hydroxyiminocyclo propan[b]chromen-1a-carboxylic acid ethyl ester (cpccoEt) into the left hind paws of rats whose L5-6 nerves were sham-operated or ligated, we examined the response of the rats to thermal stimuli provided by radiant heat.Results In sham-operated rats, glutamate, NMDA, AMPA, and (S) -DHPG reduced paw withdrawal latency (PWL) but did not have any effect on SNL rats. 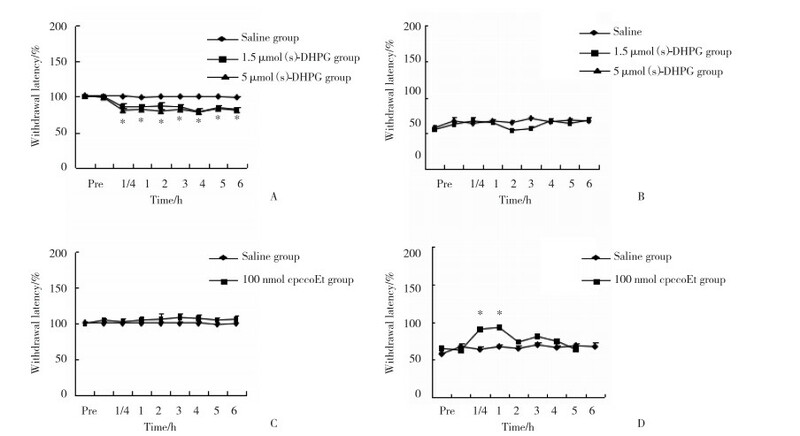 However, in SNL rats, MK-801, CNQX, and cpccoEt increased PWL but exerted no effect on sham-operated rats.Conclusion These results suggest that changes in sensitivity of peripheral ionic and group Ⅰ metabotropic glutamate receptors can lead to changes in peripheral nerve plasticity; the generation and maintenance of neuropathic pain caused by nerve injury is based on this plasticity.